Rob Liefeld, Marvel Comics Presents #51. At Banff National Park in Canada, Heather and James Hudson visit Heather’s childhood friend, Dr. Michael Twoyoungmen. In his care is a strange-looking young girl named Narya. After a night of mysterious occurrences, Dr Twoyoungmen confesses that Narya is a metamorph capable of changing into any animal of her choosing and that he is a shaman able to use magic spells. James Hudson invites both of them to join Department H, an invitation they accept. According to Valerie Cooper, Department H found Kyle Gibney, badly wounded and psychologically unstable, in the destroyed headquarters of a private genetics firm. Calling him Wild Child, the Department H scientists attempted to calm his animal-nature with hypnotherapy and drugs. There is, however, no indication in his origin story that he is preternaturally old enough to allow for his appearance in World War II as suggested by Jeph Loeb in Wolverine (Vol. 2) #54. Department H, 1974: The Wolverine trains against a robot warrior designed by James Hudson. Wildchild, as part of the second-tier Gamma Flight, tries to join, but the Wolverine tells him to back off, causing the two to promise to resolve their differences at a later date. Logan believes that Wild Child’s father learned to control his rage, but how he would know who that was is a mystery. Wolverine remembers a time at Department H when Wildchild badly scars a young girl named Stitch during training. The Wolverine nearly kills Wildchild when James Hudson comes to his rescue, telling the Wolverine that Wildchild deserves another chance. The Wolverine leaves, warning Hudson that Wildchild is a monster who needs to be put down. Logan remembers spending a lot of time relaxing at Gatineau Park in Ottawa “…to get away from all the talkin’” while at Department H.
When preparing to capture Wolverine, James Hudson as Vindicator reminds himself that he wanted the Wolverine as leader of Alpha Flight, a proposed Canadian superhero team because he was the best he was at what he did and he couldn’t be beaten. Wolverine reminds James Hudson that he never gave him a choice about joining his superhero team. It is interesting to note that Chris Claremont removed a snippet of dialogue when the story was re-released in Classic X-Men, “You never gave me a choice about bein’ changed or about joinin’ yer tin-pot Yukon Avengers.” It seems Claremont wanted to be extra clear that James Hudson had nothing to do with Logan acquiring his adamantium skeleton and claws. On the run from a group corrupt police officers, Detective Sean Bernard of the Vancouver Police Department kills two of his pursuers before running out of bullets. Taking a wound to his leg during the exchange, Bernard finds himself facing the ringleader of the dirty cops, but Logan rescues him by crippling the drug-trafficker with his claws. By 2:00 AM, Logan has gained personal approval from the Canadian Prime Minister to transfer Bernard to a top-secret base near Thunder Bay under the auspices of Department H. By the following morning, Logan has Bernard operating Hudson’s armor with a collection of Canadian superheroes-in-training: Smart Alec with his extraordinary intelligence, Narya with her shapeshifting as Snowbird, and the alleged Northern god St. Elmo with his plasma-energy. Within three weeks, Logan is training the group in an outdoor mock mission. On one particular run, Narya is unable to shift back to her human form, forcing Logan to catch her in mid-air. Logan chews out the team for their inexperience and lack of teamwork, and argues with Hudson about the mental fitness of the last member of “The Flight,” Stitch. Sean Bernard puts away his armor in a warehouse and comes upon the aforementioned Stitch, an extremely shy and quiet young girl with telekinetic abilities who takes an instant liking to Bernard and his armor. The following morning, a super-villain Egghead with a group of super-powered henchmen threatens the United States with a nuclear warhead located in Canada. Before long, Hudson has gathered the team in a military helicopter, and the Wolverine leads them on an attack against Egghead and his henchmen: Rhino with the power of a rhinoceros, Porcupine with an expertise in gas, Swordsman with a mastery of swords, Solarr with the energy of solar radiation, Eel with his electric blasts, and the muscle-bound Power Man. 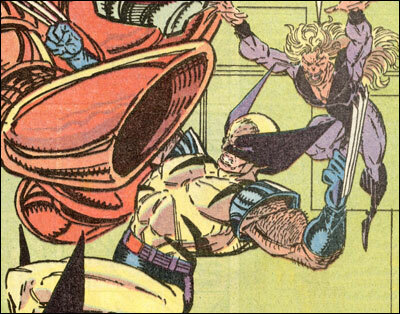 Wolverine starts off by shockingly slicing open Rhino’s midsection and trading punches with Power Man. 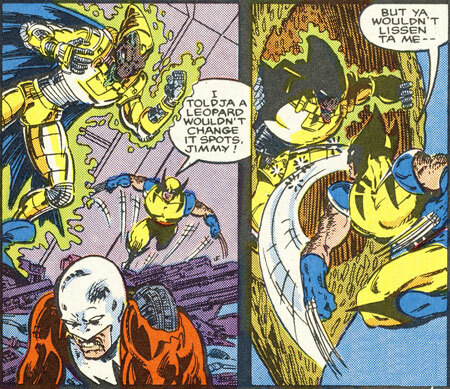 As a full-fledged battle erupts between “The Flight” and Egghead’s crew, The Wolverine moves on to the Porcupine, crippling him by shredding his gas apparatus. Meanwhile, Smart Alec attempts to defuse the nuclear bomb, but only manages to remove the guidance system. When Egghead triggers the detonation sequence, the Wolverine grabs Egghead and threatens him with his claws, but Egghead refuses to disarm the warhead, taunting the Wolverine. As a berserker rage builds inside, the Wolverine contemplates gutting Egghead on the spot, but Snowbird convinces him otherwise. St. Elmo seizes the nuclear warhead and transforms its immense energy and substance into light that he can absorb. However the extreme level of energy is overwhelming and St. Elmo vaporizes himself, saving the team and Canada. Within days, Sean Bernard quits Department H.
Wolverine reminds Hudson , “You’re forgettin’ the old days, Jimmie-boy, no matter how hard ya hit me, I’ll keep comin’ back.” This is probably in reference to training against Hudson’s Vindicator battlesuit. In a flashback generated by the psionically-powered Bedlam, it is revealed that James Hudson‘s attempt at creating a Canadian superhero from a convict with latent mutant ability backfires horribly. The mutant develops powerful psionic abilities and nearly kills Hudson, who is testing his Vindicator suit. The Wolverine attacks, and Bedlam counters with a psychic blast, but the diversion gives Hudson enough time to defeat Bedlam with a concussive blast from his Vindicator battlesuit. Wolverine explains that he quit working for James Hudson when the Bedlam experiment blew up in his face. 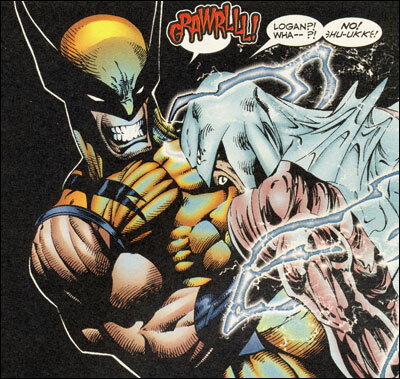 James Hudson, as Weapon Alpha, wears his Vindicator battlesuit and runs a simulated combat with Logan as a costumed Weapon X. Hudson appears to knock a bestial Weapon X unconscious, but the Wolverine counterattacks with a berserker rage and mortally wounds Hudson. Logan is tasered, and taken away while Hudson signs a waiver to receive medical treatment from the Prometheus Division. Hudson undergoes a top-secret procedure to regress his aging to heal his wounds. In conversation with Heather McDonald, Logan claims that one of the reasons he left to Department H and joined the Canadian Secret Service was because of his strong feelings for Heather Hudson. Logan tells the X-Men, “I was operational when Hudson gathered the rest of Alpha Flight.” In other words, when Logan returned to intelligence work, James Hudson continued to recruit for Alpha Flight. Heather reminds Logan that Mac always intended for the Wolverine to lead Alpha Flight. 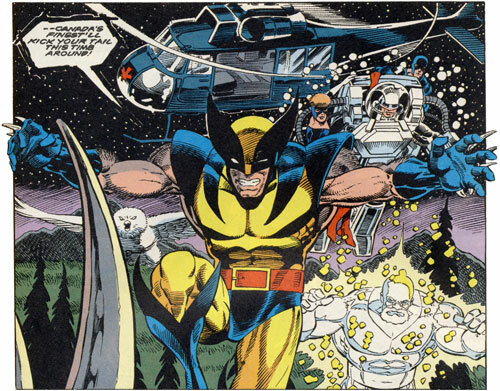 It is conceivable that James Hudson still held out hope that the Wolverine would return as lead of Alpha Flight. 2 Comments on "022: The Flight"
Are these actual number? The slash confuses me. 9 / 2 ? Is it number nine volume 2 ? How should I ask my dealer for it? It’s Alpha Flight #8 (or #9), but the story referenced is the backup story or second story of the issue.